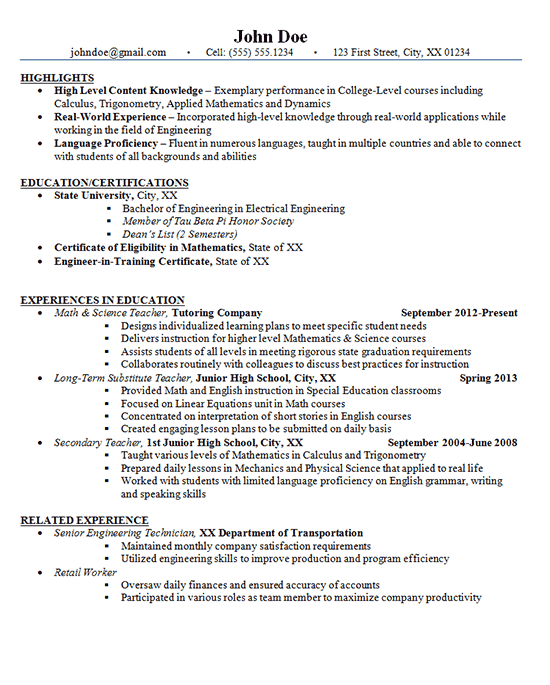 This resume was built for an education professional hoping to land a full-time job as a junior high school teacher in math and science. There were a few challenges to creating this resume that led to a very specific design. This candidate does not have a lot of experience in full-time secondary teaching and also has a long gap in employment. Aside from working in a secondary school from 2004-2008, his only experience since then is as a long-term substitute and a tutor. This isn’t necessarily a bad thing, but it may raise a red flag that it has taken so long to find full-time employment. The goal was to highlight strengths that may supersede any concerns. This was addressed by beginning with a Highlights section that demonstrates his high-level content knowledge and his unique real-world experience. The fact that he is multilingual was also a positive worth emphasizing. Candidates with those aspects in his/her background are hard to find. From there, the Education/Certifications section is listed to show his Mathematics Teaching certification. Following his Experiences in Education section, the professional resume writer included related experience to show that this teacher was employed continuously throughout the years. Designs individualized learning plans to meet specific student needs. Delivers instruction for higher level Mathematics & Science courses. Assists students of all levels in meeting rigorous state graduation requirements. Collaborates routinely with colleagues to discuss best practices for instruction. Provided Math and English instruction in Special Education classrooms. Focused on Linear Equations unit in Math courses. Concentrated on interpretation of short stories in English courses. Created engaging lesson plans to be submitted on daily basis. Taught various levels of Mathematics in Calculus and Trigonometry. Prepared daily lessons in Mechanics and Physical Science that applied to real life.